I'm sure I've said this before, but here I go again: I love my pond! It's my favorite part of my gardens. Even though the waterfall is unfinished (and not even running right now), the water is murky, the weeds are growing around it...it is my heaven. 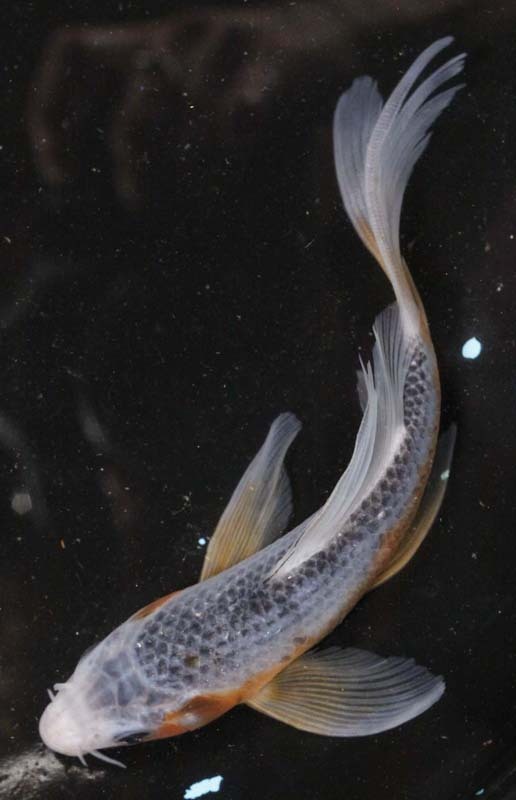 The most difficult thing about having a pond and koi has been losing fish. There was the giant, fish-eating snake. And the dreaded heron. The snake is gone; the heron is not. The big heron decoy doesn't phase it. I have lost so many of my beautiful koi to it. I'm heartbroken when I remember all those gorgeous fish, so I am trying to enjoy the remaining ones and not think about it too much. I only have four big koi left. I will not give in though! I will have a pond of beautiful fish! I'm going to try running a fishing line across the edge of pond where Big Bird does his fishing. Please don't anyone tell me it won't work. I need my little bit of hope. 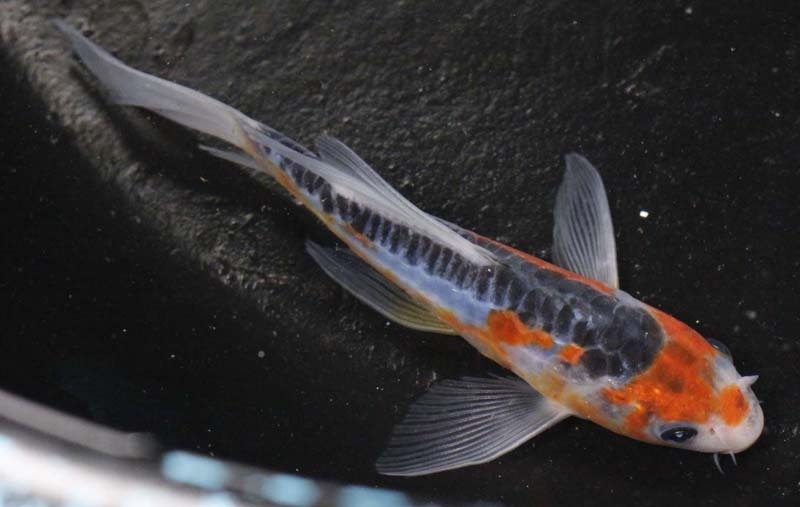 To restock, I've bought a few koi from ebay. It's my first time buying them online. My local place has closed, so it's my only option. I received the first two today, and they arrived healthy and ready to swim. This guy was ready to go and was immediately swimming with the big fish. I haven't received these three yet. Still waiting to see if I want to bid on one more (just one more!). I wish I could afford to buy bigger fish, but they're just too expensive. 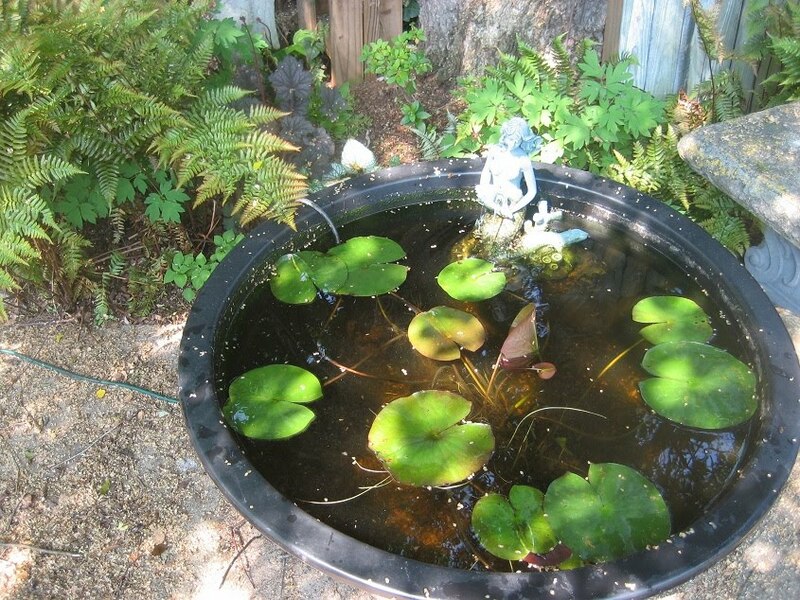 In other ponding news, my little courtyard pond is all cleaned up. I added three little, fancy goldfish to it over the weekend. They seem happy! I still need to rock around it, obviously. That's all my fishy news for now. I found you through your comment on Margaret Roach's blog. I see we have some passions in common--hens, gardening and fish. Your paintings are so beautiful and strong. 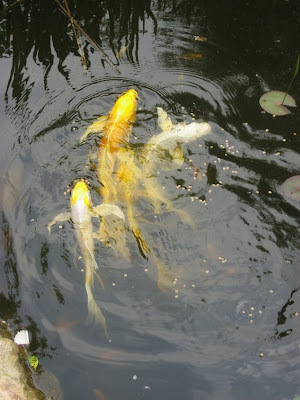 Hi,a bit like the post before, I found your blog through a like link in our profiles...in this case it was koi. The blog I'm writing from will have a link at the top right of the page called snippets...it will take you to all the problems I am having ducks eating my fish. BAH!!! 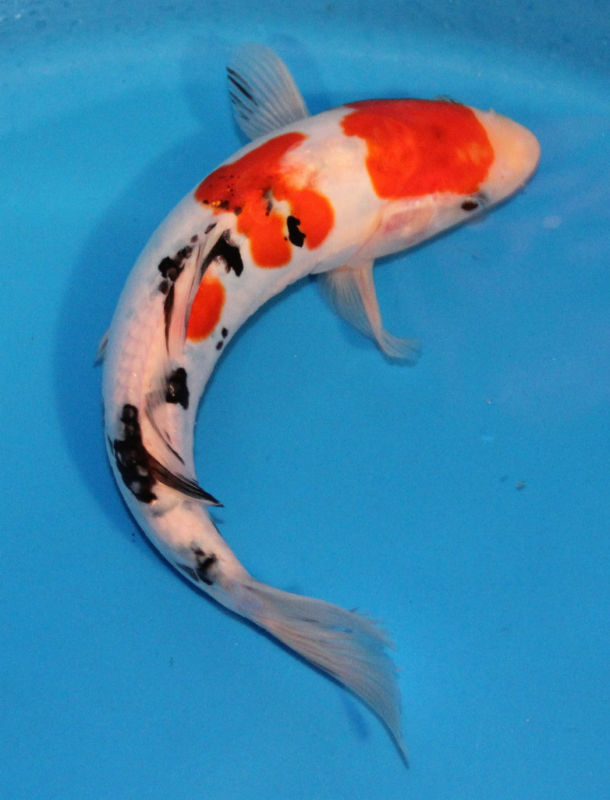 Koi on ebay? Who would have thunk it? Here's to their new home and a long life and Heron with bad eyesight and racoons to fat to forage. I found your blog by your photo of E. Veyrat Hermanos, a rose I grew until recently. I gave it to a nearby small own-root rose nursery since it was becoming way too big for my garden. I greatly admire your photos of Climbing White Maman Cochet, another rose I used to grow but gave away for lack of space. I still have the bush form, and I do grow Climbing Maman Cochet. Your blog is lovely. I'm wondering if you've gotten back into the swing of gardening, if the RRD has stayed away and how your battle with kudzu is going. Would love to see you blogging again. Take care. Ooooh. i can't allow myself to think about my two huge koi down in Florida. My son just finally went and back flushed the filter. I miss them so much. My husband said he could figure out how to move them up here. We have this tiny pond here. I don't know if it would work for them. Moving is so stressful.